Science is catching up with what we intuitively know. We feel better when we are creating any type of ART. Baking a perfectly browned aromatic pie. Dancing a free form ancient ritual. Painting a gorgeous red canvas that begins to come alive with living images. There is a popular saying that Life without Art would be a mistake!! Albert Einstein said Creativity is Intelligence having fun. Creating is FUN. When we create we get to choose over and over again how to experience, deliver and work with the elements of our craft. Feeling in control of a process feels good. We feel excited, proud and anticipate this brain bath of glowing chemicals of feel good endorphins. So what I would like to share here is, Art is also a powerful HEALER. Of our story line, our self-perceptions, our stress-response, our blood-pressure, heart health. This is just the beginning of the list. It goes on and on. Our breathing deepens and our immune system is lifted so we have a buffer against disease and depression. So Make ART=Stay Healthy and Happy. Now I want to share with you how we can take it deeper. Much deeper. Traditional healing methods were multi-faceted rituals of sometimes numerous community or tribe members dancing, singing and painting the body to “shift” the client from some difficulty. They used intentional Vibration to re-adjust that person’s electro-magnetic physical and energetic body powerfully. To over come the patterning within that person’s body. Then the whole community continued t support that person’s transiton by supportive behaviors and social networking. It takes a Village perfectly demonstrates this concept. Now compare that to the way we today isolate ourselves and take our problems to little rooms where strangers talk to us in freudian conversation for years. —I asked how this would all work together? I set up an experiement by finding 4 people to take them through this multi-faceted approach. 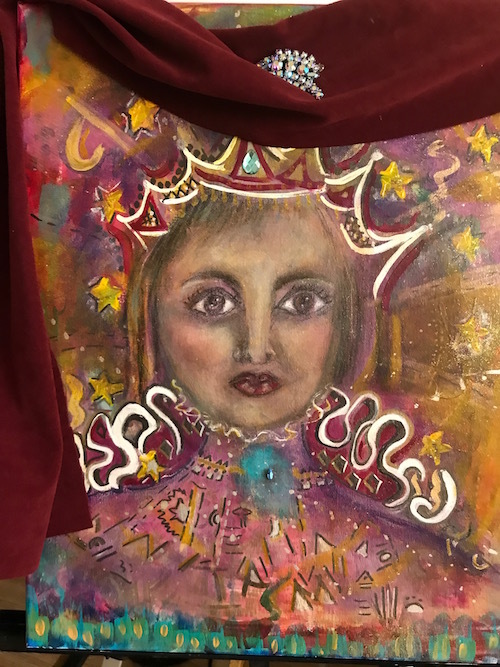 Over one month I painted their Soul Essence Portrait, kept notes in a booklet for each participant, communicated with them thru email and had a one to one session with each that included the Be the Light Process. The results were tracked using a questionnaire to be able to use numerical data for statistics. You know what? The breakthrus, the release of pain, issues and re-setting of their lives was so much more than I could have ever imagined. Well for 3 of them anyway, as one was a control subject. One month, a Three-tiered approach and new lives for these 3 women. You might be interested in hearing all about it with this 15 min video report. It’s not a tell-all report to guard their privacy, but you will see what happened overall. Here’s the link: Report on the Healing Experiment. Anything can be shifted. But here is the key. First, the reason the person HAS this issue must be fully addressed. It might be part of a soul lesson or contract with another being. IF the underlying issue is un-earthed and released well them of course what we call a “miracle” healing can occur. So people heal when they are ready and when they believe they can. So I do believe this artistic AND education AND introspective AND healing realtionship is the perfect bridge for people to transiton form one pattern into another. To be free. To live life in the moment without referencing life from their previous traumas or even unconscious or other lifetime issues carried over. After all, we are complex interdimensional beings so I never tire of approaching this topic of healing and humans. Absolutely! There are infinite methods for evoking healing and change. God is unlimited; Creation is unlimited; Creativity is unlimited. What it takes is sincerity, integrity, imagination and opening to the Divine. Jan has made of herself a wonderful conduit through her life of spiritual explorations and dedication and now has found a mode of work that is truly inspired and unique. I am particularly impressed with the process she uses, the layering and the multiple facets/modes of approach. The setting of an explicit goal, the time allotted (neither too short nor too long), the parts of the process, the checks and measures, and the physical product are clearly and discretely defined, but the means of reaching them is not just a single session nor even a single type of treatment. She uses layers over time, allowing and bringing through genuine perceptions and interpretations in the form of art that can be reflected upon again and again. She elicits and encourages thought and focus. She provides so many forms of feedback — the gorgeous art, the journal that records the insights and perceptions she had while making it, the phone consultation and the questionnaires to bookend the project. There is depth and there is beauty and there is extra-sensory/inter-dimensional perception all together. Ahhh… and there is something special that is desperately missing or depleted from our lives and society on the whole, and that is HONORING. What Jan is doing is honoring, greatly, the person she is working with, producing in the end a reflection of the self the person has yet to see, through Jan’s own inner eye and insight. Anyone who brings more honor into the world has a very special gift and mission. I have seen innumerable modes and processes and techniques for energy work, for healing, for self-improvement across many cultures and countries. Each has been impressive and effective in its own way. I LIKE the way that Jan is doing this the best of all so far. 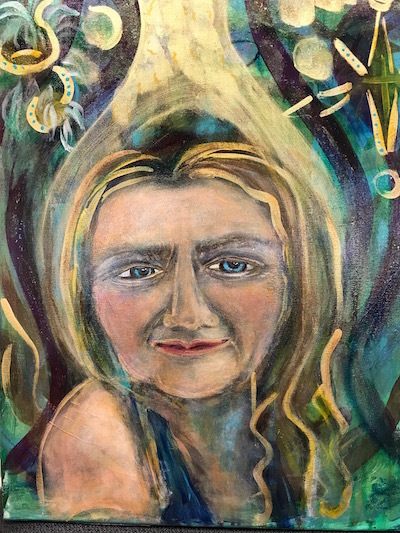 What is more, her painting of the subject in this spiritually oriented way accomplishes and reveals something all the spiritual teachings try to convey – that you and I are one. There is something of each blended into this one image and that includes or emphasizes, perhaps, the large one-ness within us. I can see all that in the image at the same time. It’s a great visual model of that teaching.